For zigzag transformers, the program automatically assigns the names TZ-1, TZ-2, TZ-3, and so on. From Bus The bus from which the transformer connects, which must already exist on the one-line. For reference, the From Bus base kV is displayed next to the bus name. Voltage Rating (kV) Transformer nameplate rated kV. Impedance (Ohms) Transformer nameplate impedance in ohms. This is the impedance between each line terminal and neutral. 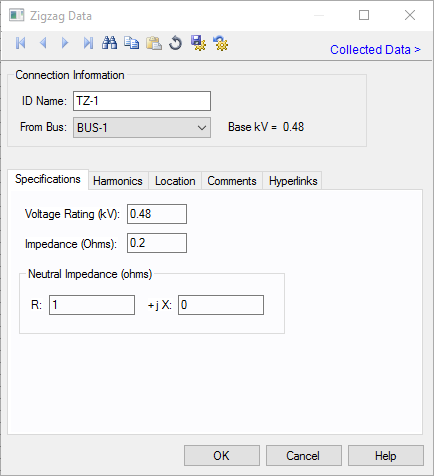 R Transformer neutral ground resistance in ohms.